With the Bitterroot Mountains in front of us, we drove on to Paradise where our train, the Northern Parks Limited, was waiting for us. 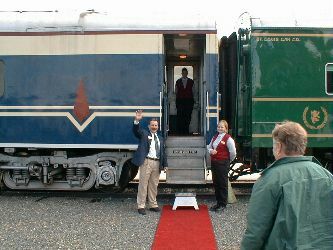 The Train Master, Mike Philips, and the Head Steward greeted us. 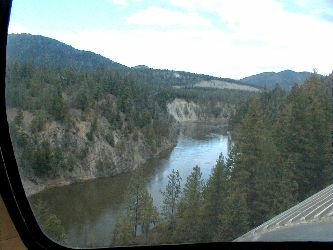 On board, we had a brief introduction by our porter and then went to the observation car for champagne and hors d'ouerves while the train began rolling along beside the Clark Fork River (a tributary of the Columbia) through Fish Creek Canyon and Alberton Gorge en route to Missoula. This is the route of the Montana Rail Link (originally part of the Northern Pacific) and it runs through the same valley as Interstate 90. We occasionally glipsed sections of the highway. Dinner was served at 6:30, after which we stopped at Missoula for the first night on the train.